Crespin developed this image for Robert B. Goldschmidt, a professor of chemistry in Brussels who, among his many other accomplishments, had developed a pharmaceutical product known as Actiphos. 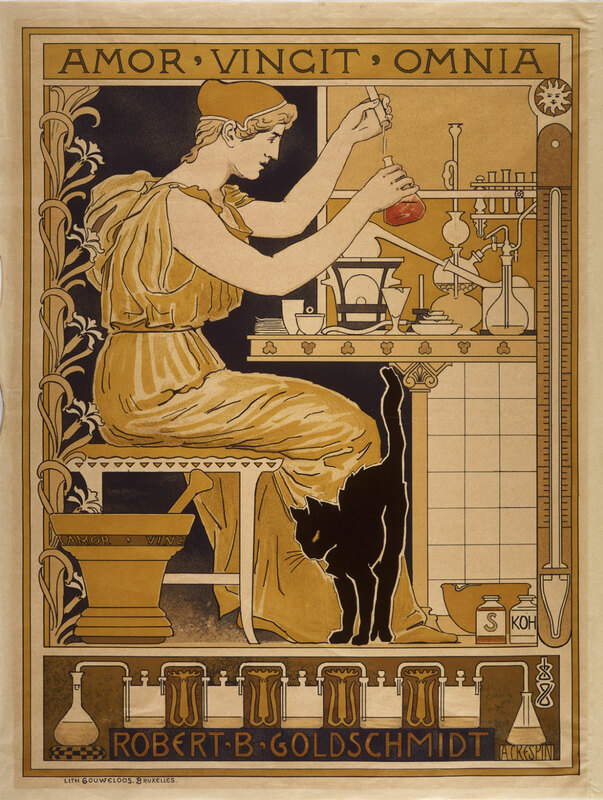 Standing among varied chemical and pharmaceutical apparatus is a large black cat, in all probability an allusion to Goldschmidt's known affection for the animal. The bottles at the lower right, labeled for sulfur (S) and potassium hydroxide (KOH), represent a play on the French phrase souffre et potasse, in argot meaning "to study." William H. Helfand, from The Picture of Health: Images of Medicine and Pharmacy from the William H. Helfand Collection (1991), p.26.